Update: Monday Track Session: There was a record turn out of 27 runners for our weekly track session. It is great to see so many new faces. If you haven’t come to one of our training sessions before then now is the ideal time as there are plenty of people that are in the same boat as you. Just turn up and do what you can. There is an even split of women and men and ability levels at the training session. Friendly Advice – It is very important that you don’t overdo it too early. Take it easy for the first few weeks and build up your fitness gradually. Update: Track Race: Well done to Killian Cullagh at the recent county schools 1500m. Killian won gold in both the 1500m and 1500m steeple chase. He also won gold a few days later in the Munster junior track and field 3000m steeple chase. Joey Hannon: The 2nd race of the National Series took place on Sunday. The venue for this was UL in Limerick. In the NS Olympic distance event, the club were represented by 5 members. Kevin Sherlock was the first male home for the club in a fast time of 2:14. Next home were Eoin Sheehan, Ronan Walsh, Jerry O’Mahony. Geraldine Kyne was the club’s first woman home. Well done to all five of ye for bringing home much needed NS points for the club! In the sprint, the club also had 5 members taking part. Darren Dunne finished in 8th place overall. 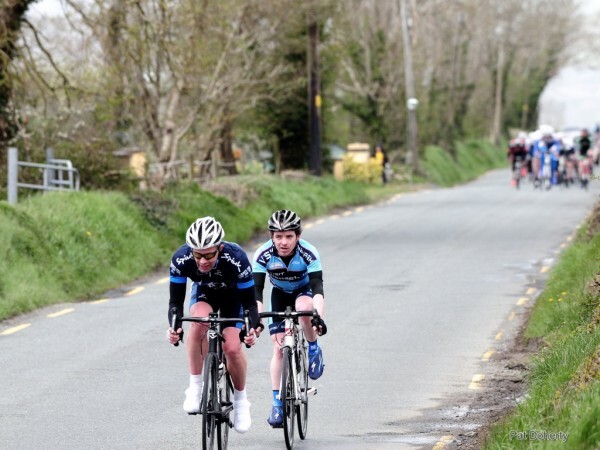 Cian McCormack was next followed by our other junior Ross O’Meara. Shortly after Ross was Martin Farrell and Mary Donnellan. Well done to everyone that took part. Saturday Cycle: About 16 turned up on Saturday morning for a flat(ish) cycle to Roscrea, Birr & Borrisokane. The group had a wind to contend with for what seemed like most of the cycle, but after a dull start the sun started to shine on their way home and this made for a very solid training session. The journey was uneventful to Roscrea and they then headed into a strong westerly wind on their way to Birr. After a quick stop at the Blackbull, two of the lads at the front of the group came up with an inspired idea. They saw an old Zetor tractor with a nice boxy cab on the road ahead and caught up with it, in the hope of getting the wind blocked all the way to Birr. But just as the tractor was caught, it turned down a side road! From Birr the pace was increased substantially and there was a strong average of about 21 miles an hour into Borrisokane. The pace slackened a bit on the way back into Nenagh where we finished a 3 hour cycle (a distance of 53.5 miles) with an overall average speed of 17.5 miles per hour. Bike Racing: four club members were in bike racing action this weekend. Eoin Woolley, Keith Butler, Shane Scully and Kevin Moyles were down in Currow, Co. Kerry for the John Drumm Memorial. Shane was taking part in his first A1/A2 race and came home in 16th place. Kevin Moyles came home in 11th place in the A3 race. Keith finished in the bunch in the A4 race but unfortunately Eoin crashed out on the 3rd lap of four.